The next kumbh mela (or fair or Mahaparv) is being organised at Ujjain, a city in Madhya Pradesh (MP) State of India. The fair starts on 22nd April, 2016 and will be there for a month. Ujjain is an old, historic, mythological and pious city. Moreover. it is blessed with unparalleled religious footprints of India. This includes Mahakaal Temple of Lord Shiva (a Jyotirling), the Harsiddhi temple (a Shaktipeeth), Lord Ganesha's Chintamani Temple, the holy Shipra river and a number of other religious and spiritual landmarks. The word Kumbh means a Pitcher signifying the pitcher of Nectar. Mela means a big fair or congregation. Mythological legend says that once upon a time, there was a war between the Gods and Demons for the possession of elixir or nectar of eternal life. During the scuffle, a few drops of nectar had fallen at four places on the Earth. These places are: Prayag, Haridwar, Ujjain, and Nashik. It is believed that these drops gave spiritual and mystical power to these places, particularly their water bodies. In addition, there are some planetary positions which enhance the mystical power of these places. Based on the planetary positions, Kumbh Melas/Fairs are organised at these places on regular intervals. Thus, Ujjain is one of those places where the mythological nectar/elixir of life is available in the Shipra river.When the Sun (Surya) is in the zodiac sign Aries (Mesh) and Jupiter (Guru/Vrihaspati) in the zodiac Leo (Simha), a kumbh mela is held in Ujjain. Thus, Ujjain Kumbh is held when a rare configuration of planets takes place once in 12 years. Due to Jupiter's position in Leo (singh), Ujjain Kumbh is also known as Singhastha Kumbh. This time, a month long Singhastha Kumbh is happening at Ujjain between 22nd of April and 21st of May, 2016. In addition to taking a holy dip in the nectar of river Shipra, you must also visit the famous temples specially the Mahakaal Temple and Harsiddhi temple. In normal course, doing either of these is considered a lifetime opportunity. And doing this all at one point of time, at one place happens only with the choicest grace of the almighty; when he really wants to elevate you and make you cross the ocean of life blissfully. So, don't miss the Ujjain Kumbh Mela. 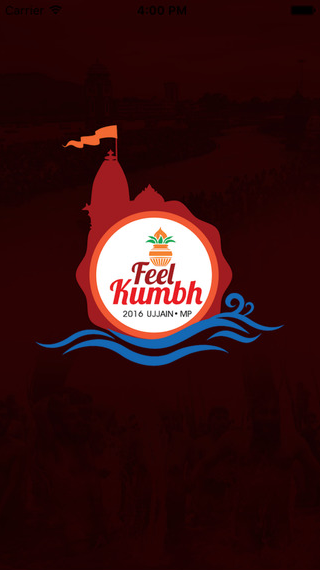 Our app 'Feel Kumbh' is there to facilitate your journey to Ujjain kumbh mela and in its ecstasy. It gives detailed account of the Ujjain kumbh fair, various facets and features of the Singhastha Mahaparv and the places and landmarks in and around Ujjain. In addition, it also captures the rich tourist attractions of MP including Khajuraho, Omkareshwar, Maiher, Bhopal, Indore etc. The routes, travel links, hotels and other daily need services can be located easily through the app. 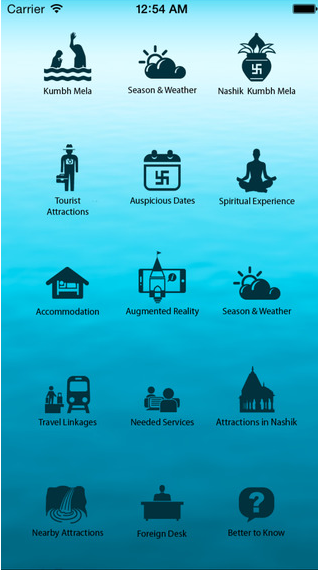 A unique feature of the Feel Kumbh app is the Friend Locator. Through this app, you will be able to keep in touch and locate your group members in the kumbh mela which has the distinction of being the biggest human gathering at one place and time on the planet earth.